We’re going to have some news about Cpl. Jonathan Yale and Lance Cpl. Jordan Haerter in this Monday’s paper, so I just wanted to re-post a pretty epic piece of literature about the two Marines. Actually, it was oration, a speech, borderline eulogy, given at a luncheon by Gen. John Kelly just a four days following the death of his own son in combat in Afghanistan. “Five years ago, two Marines from two different walks of life who had literally just met were told to stand guard in front of their outpost’s entry control point. Well, it’s now been about six years, and I’m here to let you know, there are people in Congress who have not forgotten the sacrifice of these two Marines. Bravery is what Marines are made of. SO MANY HAVE GIVE ALL,THESE MEN WERE AMONG The GRATEST AND I am SURE THAT GOD GAVE THEM A SPECIAL pLACE IN HiS HEAVENWe have lost so many in Battles yet they give up their way o,f life to keep America free and never complain, they leave their familiest behing for the people of this country.It is unfortunate our government views them as ,just doing a Job.Our military never gets the respect it trule deserves.Our government Shows them little and at times no Respect..
God Bless them and their families! True heroes who knew the price that freedom sometimes requires of the brave! Semper Fi, Marines and thank you for what you did. Gentlemen your next duty station is the Gates Of Heaven, your primary assignment is to guard the Streets Of Heaven until properly relived or a new set of Orders arrives in your name. Semper Fi Marines your last duty station reports you both have upheld the finest Traditions of the US Marine Corps and the United States Navel Service.!!! With tears in my eyes, and a lump in my throat Semper fi and God bless. Love our young Marine heros and will continue to grieve for our dead and our wounded including the loss of Gen. Kellys son. My son Corporal Luke Connally was severely wounded by an Iraqi suicide car bomber in Dec. 2004 at Haditha Dam. But what broke our hearts was that his buddy Corporal Zachary Kola was killed during the blast. I still grieve for his mother’s loss. For some, the war will never be over. I have bookmarked this URL for the next time I hear some Eurocrat or the equivalent speak badly of the US Military. A Navy Cross is fitting but perhaps a posthumous CMOH might come into play. These two brave young men exemplify what it means to be a Marine. Stand no lean into the face of death. I owe my freedom to men like these. Thank you! 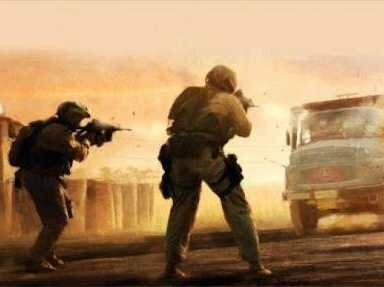 If anybody deserves the Medal Of Honor, then these two Marines certainly do for only doing what they were trained to do. Semper Fi and may God bless them and their families. God bless America because nobody else will. Amazing feats of courage. “Greater love hath no man, than he who gives his life for a brother”. I was at General Kelly’s son’s funeral and it was both heart-breaking and awe-inspiring. General Kelly has the gift, he knows the truth…he is a Marine’s Marine. Semper Fidelis…to God, Family, Country and Corps!